Here is a remake of my Super TNT mod for 1.7.2. It currently has 56 TNTs. Below is a list of all 56 of them and a description of what they all do. For a more detailed description including recipes and screenshots, go here. The Super TNT of Mass Destruction - Makes a huge crater. If I had to guess, I would estimate that it's 5000x bigger than the regular tnt. Doom TNT: The Gold Plated Plutonium Alloy Coated Eight Volume Nuclear Donkey Edition - This one is 3-5 times bigger than the Super TNT of Mass Destruction. The End TNT - The One To Rule Them All - This one make an enormous hole. Black Hole TNT - this one makes an even bigger hole. To reduce lag, it makes a square crater and not a round crater. It's a 1000x1000 hole. Anti-Dimensional Singularity TNT - Makes a ludicrously enormous explosion. It's 5000x5000 blocks. NO - Makes the biggest explosion in the mod. 10000x10000 in size. The Biome Buster - Turns your biome into a post-apocalyptic wasteland. Cluster TNT - Spawns 100s of regular tnts everywhere. Super Cluster TNT - Spawns some Cluster TNTs which then spawn bazillions of regular tnts everywhere. Heck TNT - Turns everything into a nether biome. Fire TNT - Makes fire go everywhere. Snow TNT - Makes snow go everywhere, freezes water if its close enough. Ocean TNT - Makes an ocean. Works 10000000 times better and more efficiently than it did in the old version of the mod. Sponge TNT - Can be used to soak up a large body of water. Must be submerged in water to work. Lava Ocean TNT - Does the same thing as the Ocean TNT except it does it with lava. Diamond Nuke TNT - more op than the Diamond TNT. It's serious stuff. Mob TNT - Spawns a random mob. Withers and Enderdragons won't spawn from this. Mob Swarm TNT - Spawns 700-800 random mobs. Withers and Enderdragons won't spawn from this. Atomic Mob Swarm TNT - Spawns ~1500 random mobs including withers. Enderdragons don't spawn because Minecraft 1.12.2 has a bug where spawning enderdragons doesn't work properly. Anti Mob TNT - A TNT that kills mobs but doesn't destroy terrain. Arrow TNT - shoots arrows everywhere. Tiny Island TNT - Spawns a small floating island. Island TNT - Copies land around it and pastes it around 30-50 blocks in the air. Everything TNT - Spawns everything in the game randomly all over the place at random. Quite dangerous. LGBTQQIP2SAA TNT - Makes everything rainbow. Trump TNT - All this does is build a wall and make the villagers pay for it. Kim Jong TNT - offends North Korea and starts WW3 irl. 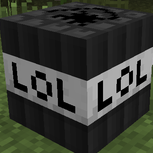 The most dangerous TNT in the whole mod. Screenshots can never be posted or shown for safety reasons although it is in no way offensive or obscene. Crappy TNT - This one is crappy. Really Crappy TNT - This one is really crappy. Cheesy TNT - Turns everything into cheese and then proceeds to play a song about cheese on a jukebox. Flat TNT - Flattens everything around it. Mining TNT - Place this underground to make a flat cavern with torches to illuminate the place. Useful for making a mining shaft or something. Lightning TNT - Makes a ton of lighting go everywhere. Crack TNT - Makes a huge fault line in the ground that goes all the way down to bedrock. Weed TNT - Spawns weeds, grass, saplings, sugar cane and other random foliage everywhere. Fact TNT - Tells you a random fact. Facts given from the Fact TNT may or may not be 100% correct. Airborne TNT - Spawns weeds, grass, saplings, sugar cane and other random foliage everywhere. Jail TNT - Spawns a jail and then teleports all entities and mobs including the player into it. Teleportation TNT - Teleports all entities and mobs including the player to wherever it explodes. Warp TNT - Warps each player/mob/entity to a random coordinate in the map. Atomic Diamond TNT - Makes a gazillion diamonds go everywhere, engulfing everything in its path. Incredibly op. Atomic Lava Nuke TNT - Makes lava engulf a large area of the map. Pretty much the same thing as the Atomic Diamond TNT except with lava instead of diamond. Here are some videos I made about it. To play this mod, you need to be using Minecraft 1.12.2. Forge also has to be installed. In order to prevent your game from crashing and for maximum smoothness, you should probably use -Xmx3G for your launch arguments but I recommend -Xmx8G if you have the ram for it. This mod does take less ram than the 1.7.2 version and lags less but it still helps to have a good computer and have java properly set up. HERE is the link to the download page! The latest version is for 1.12.2 and the mod version is 1.0.1. This is a fantastic mod! I created an account just to say this. It's about damn time we got a tnts mod for a current or at least more recent version of Minecraft. The Too Much TNT mod, the only good tnts mod before I found this was on 1.8. 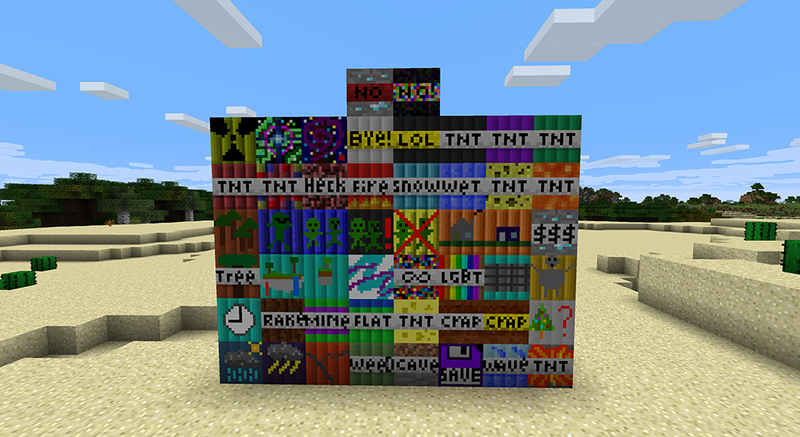 This basically has the same stuff as Too Much TNT but they got rid of all the boring bombs that aren't very interesting like and added more fun ones. It runs without lag for the most part too which I appreciate. Don't know why it was so hard to find this mod or WHY it is so obscure and not popular but I just wanted to tell the author, THANK YOU. I NEEDED THIS. This mod looks fantastic! Glad to finally see a good TNT mod for 1.12.2. The only other working TNT mod for 1.12.2 that I found, called xPlosions or something, really isn't very good. The Black Hole TNT looks sick. I've always wanted to level the entire map. Those villagers are in for a real treat. Hehe. Here is a remake of the Super TNT mod for 1.7.2. It currently has 50 TNTs. Below is a list of all 50 of them and a description of what they all do. The latest version is for 1.12.2 and the mod version is 1.0.0. This is hell lot of a mod pack! Totally mind blowing. Thank you so much for creating this. It took a while for me find the exact version and here it is yay! Added 6 new TNTs: Arrow TNT, Airborne TNT, Teleportation TNT, Warp TNT, Fact TNT and Jail TNT. Modified the Mine TNT so that when it encounters ores, it will mine them and then drop the ore on the ground rather than delete it entirely causing any resources caught in the blast to be lost. Now, you can use the Mine TNT and be able to pick up ores that it Mined. Added a splash logo for the mcmodinfo screen.